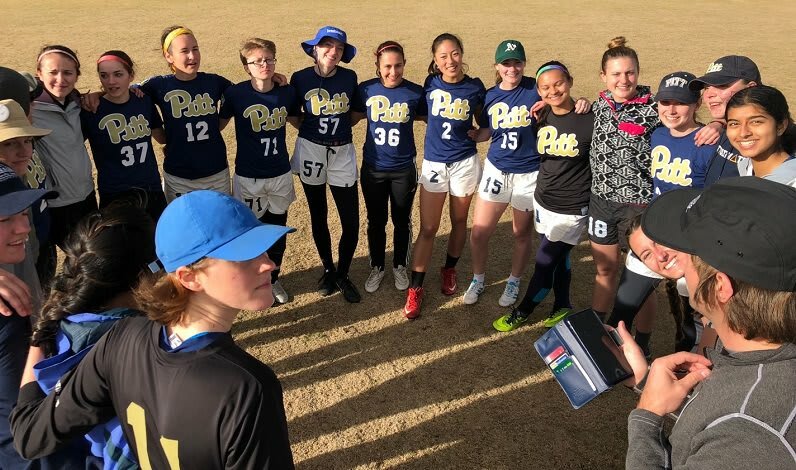 Although this campaign has concluded, if you would still like to make a donation to support Pitt Women's Ultimate, you may always do so here. Known to our friends and families as Danger, we are the University of Pittsburgh’s Women’s Club Ultimate Team. Our team is comprised of 23 dedicated, enthusiastic, intelligent, hard-working athletes who love to play ultimate! We come from all over the country, and work hard to represent Pitt well. Every year, our biggest tournament sequence is called The Series. The Series is comprised of Sectionals, Regionals, and finally, Nationals. In order to compete at Nationals, our team must place either first or second at the Regional tournament at the end of April. Danger is included in the Ohio Valley Region, and for the past five years we have placed within the top three teams of our region. Last year, we achieved our goal to represent Pitt at College Nationals. Danger won the Ohio Valley region again last year in the first bid to go to Nationals in Mason, OH. While the team played hard, the finish wasn’t what we had hoped for. This year we hope to have the opportunity to improve! We need your help to get us through The Series this year so we can return to Wisconsin and represent Pitt at Nationals! Be sure to watch our video, check us out on our website, or follow us on Twitter (@PittUltimateW), Facebook (Pitt Women's Ultimate), and Instagram (@pittultimatew) to see what our team is all about! The backhand is the throw you learn first. It may seem simple, but it is one of the most important throws a player can master. Your donation of $25 helps fill up two cars with gas on the way to our tournaments. The flick throw is usually the second throw a player learns. Once mastered, it allows players to throw trickier throws, and more successfully play against the defense. Your donation of $50 will cover the cost of a hotel room for one night. Lefty backhand--a favorite of Head Coach Ben Banyas--is a clever way to trip up the mark and get off those quick give-and-goes. Like the lefty backhand, $75 is a great way to give so that a player can go to Nationals. A scoober is an upside down throw from across the chest. This is used by experienced throwers. Your donation of $100 partially pays for a bid fee for a tournament. The hammer is an inverted over-the-head-throw. It is a tricky throw, but also one of the most fulfilling feelings upon completion. Your donation of $250 will cover the cost of gas for all of our cars for a tournament. Though not a type of throw, a layout D is one of the most exciting and important defensive moves a player can make on the field. $500 will pay for the team to attend a tournament like Northwest Challenge. A greatest is THE ultimate play in a game - it is when a player is in the air and catches the disc out of bounds, but manages to throw the disc back in bounds before hitting the grass. Another player is then there in the end zone to catch the disc for the score. A gift of $1,000 pays for two flights for cross country tournaments.